He came to us as an 8 week old puppy. One warm spring day, I received a phone message from Esther Acha. It went something like this: "Cindy, It's Esther. You're puppy will be arriving in 4 days! 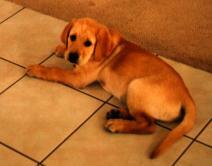 He is a yellow Labrador Retriever named 'Payson'. You need to pick him up from the Ontario Airport. Call me for the flight number and directions." It's difficult to portray my excitement over these turn of events. Let me recall back several years...Early winter 1995, I was attending my monthly 4-H Club meeting (the Monte Vista 4-H Diamonds). What I encountered that evening was to change my thoughts of 4-H projects forever. There was a handsome German Shepherd puppy wearing a green coat under the table where we sat. I couldn't refrain from looking at him ... I knew he was a guide dog puppy in training. For years I had begged my parents to let me raise a guide dog puppy... but to no avail. They didn't want another dog, and certainly not a puppy. This particular year, I got lucky. I talked about guide dog puppies for weeks after that meeting. I never really phrased the question "Can I raise a guide dog puppy?" because I knew the answer they'd give. Instead, I did lots of research on the Internet. I read everything I could find about guide dogs and puppy raising. I even phoned the 4-H club leader to find out more about this project. Finally, it was a small piece of info that hooked me: there was to be a guide dog project meeting in a week or so. I told my parents that I was going. They didn't complain... and when I came back from it I was very excited. I had seen several Labradors and a German Shepherd, and had met Esther Acha who was blind and had a guide dog. It was all very exciting! Somehow, I managed to fill out the application form for a pup... and my parents even signed it. Miraculous! So... we proceeded to plan for a puppy. We had a home interview from the project leader, Pam. Esther came too, with her guide dog. We watched "Special Partners", a video produced by Guide Dogs for the Blind, Inc. Then we waited months for our puppy. We had applied for "any breed", but we did specify that we wanted a male. (We didn't want to deal with females coming into heat). 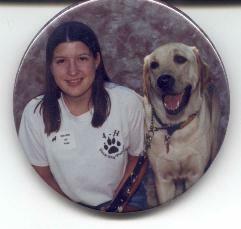 During these months, I attended all guide dog project meetings and socialization trips. We toured the airport with the groups' pups, and went to one "fun day" in Oceanside. Dad and I bought a special "guide dog leash" and we fixed up the dog run so that a pup couldn't squeeze through the fencing. We were ready and waiting! The phone call came and I was even more excited. One day after school my Dad, my sister, and I drove to the airport to pick up Payson. At the building where the packages, crates, etc. were unloaded, a man said "Oh, you mean the puppy that's been barking all the time?" Yes, that was our Payson. He brought out a large crate containing a yellow wiggle-worm puppy. It had a bag attached that held all of his information and a puppy coat & collar. Payson was very quiet on the ride home. We showed him to our neighbors and finally Mom when she came home from work. He was so cute! That's his puppy picture above. He finally passed the housebreaking stage, got all his shots, and was able to go out into the world. We took him shopping, to the movie theaters, and to restaurants. Everyone (well, almost) was always happy to see him. He went with us to the puppy meetings, 4-H meetings, and socialization outings. Multiple "fun days" passed. I taught him basic commands and manners. Payson really was a fantastic puppy. He grew to be quite large, too. I conferred with my high school principal, Dr. Glenna Ramsey. She was very interested in my project and said that she'd like to help. For about one semester, she talked to the school board and asked for permission for Payson to come to school with me. Finally, we were able to go to school together. It was my senior year in high school, and Payson started coming to school in January 1997 or so. (He was born 3/23/96, so this made him 10-11 months old at the time). People loved him, and he did a fine job of behaving himself in my classes. He went to Ayala High School daily with me. One time in class, he was acting very strangely. I quickly rushed him outside (in the midst of a lecture!) just in time for him to vomit up a makeup sponge, whole. Yuck! Another time, in calculus, someone came to class late and tripped over him. Everyone laughed, but I felt bad that he was in the way. :) I even used my puppy raising project as my government project. He was my "community service". We even graduated together! He walked with me to receive my high school diploma. What other kind of fun things did we do throughout the year? Well, as a puppy raising group, we did LOTS of fun stuff. When Payson was 3 months old, we took him to his first restaurant. One time we rode the train into Los Angeles and shopped for the day. The first "big fun day" at San Raphael was fun, too. Most of the pups in the group and their raisers drove up North with their families. We set up camp in Samuel P. Taylor State Park. The pups even had a whole tent to themselves! (We put them in their crates within the tent). The next day we walked around the Guide Dogs' campus and toured the kennels (sort of). Leaving our pups there, we traveled into downtown San Raphael to walk behind a guide dog trainer while she worked a dog. The day after that, we attended the "Fun Day" at the Guide Dog campus. It was great fun, and very nice to see 100's of guide dog pups in one day. Fun Day 1997 was the last Fun Day we ever attended with Payson. This time, Dad and I drove up to San Raphael and checked into a nice hotel. Payson was with us, of course. (All 75 lbs. of him!). We went to the Oakland Airport to pick up my mom, and Payson went too. He even took the little airport transportation van, and went through the metal detecting machine. This Fun Day was also very nice and definitely "fun". Upon arrival at home, we found a letter waiting for us. It was Payson's "recall letter". It was time for us to send him back to the Guide Dog kennels for formal training. We all became very sad. The day came when we had to take him to the Topanga Canyon Guide Dog kennel (a boarding kennel, not a training kennel). He was put into a dog run and we were going to leave. He started jumping on the fence and barking... he must have known we were going to leave him for good. It was very difficult for us all... here was our closely-bonded dog...and we had to leave him. Lots of tears were shed that day and during the week to follow. Progress reports told us that he was doing well. At least, he was getting "C"s and most dogs didn't do better than that. For about 4 months (August to December 1997) we continued to get good progress reports. One said that he was chewing his paws, and they were trying the Tellington Touch on him. (As if it were stress creating the chewing behavior). But overall, he was doing OK. December, 1997: We were shocked with a phone call saying that Payson had been dropped from the training program. We were even more shocked when they said that he was being dropped for aggression. They told us that he growled and snapped at a trainer when being placed into the down position. He had lunged at the fence barking when someone walked by. That was it... they deemed him "aggressive" and warned us that it would not be a pretty picture to have him as our pet. We were shocked because Payson had never behaved this way at home. He never growled, bared his teeth, snapped, etc. He was always a happy, willing dog to work with in all situations. The decision was mine to make: should I take Payson back as a career change dog, or should I let Guide Dogs find him a good home? Guide Dogs for the Blind, Inc. made the decision even tougher when they told me this: If I took Payson back, I could never raise another puppy while Payson was alive. "Aggression is a learned thing: dogs can teach other dogs to be aggressive". They didn't want their puppies to be put into such a dangerous situation. Our decision: Get Payson back! We drove to Topanga Canyon kennels to get him. They treated him like a dangerous, wild animal. He was brought out of the truck with much caution, and carefully we were handed his leash. But it was Payson, our cheerful puppy! He was himself, and not aggressive in the least. To this day, we don't understand what may have brought on aggression in this wonderful dog. Everyone who knew him before training, and everyone he has met since, has never seen him in an aggressive state. So I am stuck without another guide dog puppy to raise. It was an activity I had planned on doing for years after Payson, whether we kept him or not. I really loved guide dog puppy raising... I recommend it to anyone who can stomach the sadness of the pup's departure. I realize that I may be permitted to raise a guide dog puppy for another organization. Such as Guide Dogs of America, Guide Dogs of the Desert, and such. I could even raise a Canine Companion for Independence. However, I once fell in love with Guide Dogs for the Blind, Inc. Since then, no other organization has drawn me to it like GDB. No other organization probably ever will... I'll just have to wait until Payson passes on. That will be a sad day indeed. UPDATE: August, 2003. I noticed that the bony ridge on Payson's skull (between his ears and more caudal) was not so evident...instead, it was surrounded by some sort of hard bump. I thought the bump was bone. But when we took x-rays, it was evident that it was some sort of tumor. Things did not look good, but I still kept my thoughts positive. Payson was acting perfectly normal and was actually overweight (93 pounds). Payson had surgery late one night and most of the tumor was removed. Dr. Beeley said it looked more fibrous, even though we were expecting more of a bony mass. Multiple pieces of the tumor were sent to the lab to be examined by a pathologist. The report came back on August 20th, 2003: chondrosarcoma; prognosis: guarded. Chondrosarcoma is cancer that originates in cartilage cells (chondro- means cartilage). It is a slow-to-metastasize (spread) and slow-to-grow tumor, meaning that complete surgical removal is one of the best and only ways to cure it. After some hemming and hawing (Payson's first surgery left him very painful for 2-3 days afterwards, and there was a huge amount of swelling over his entire face), I agreed to a second surgery to remove more tumor and some bone. This time I requested a fentanyl patch be applied for pain (fentanyl is a narcotic that comes in a patch form; when applied to a dog's skin it releases the drug over 3 days' time). Payson's surgery was a huge success! Dr. Beeley felt confident that he removed anything even remotely abnormal looking and he even used a bone saw to remove part of the nuchal crest (from the occipital bone). Payson was on antibiotics after the surgery and was feeling completely normal the day after. He was doing excellent. Then, on September 8th (just 5 days after the surgery), Payson started seizuring out-of-the blue. They were grand mal seizures (basically, full blown) that lasted 1 minute and he had them every 3-4 minutes. I had just arrived home from work and found him in the middle of his 2nd seizure. We (Mom, Dad and I) put him on a huge blanket and lifted him into my dad's truck (the crew cab portion). I sat with Payson the entire way to the animal hospital (where I work), as he continued to seizure. I talked to him, told him I/we loved him and that somehow things would be OK. My parents and I discussed euthanasia in the truck, because we figured that the cancer was causing his seizures (it must have spread to his brain). After arriving at the animal hospital, an IV catheter was placed immediately. Payson was given some valium (diazepam) to stop the seizures. I knew this would only be temporary, as nothing could stop the cancer at this point. So we all said our good byes and we hugged Payson as he was euthanised. It was one of the most difficult things I've had to go through yet. Euthanising other people's animals, watching other people's pets seizure, is NOT the same as doing it to your own pet, your own family member. Payson was only 7 years old. He had half a lifetime left. Our hearts have a huge hole in them now. Only time will help us heal. Payson was a special dog, and we will have fond memories and never forget him. One day, we will see him again.